Visitors to this land might think of it as a wilderness, but for the Ɂehdzo Got’ı̨nę of the Sahtú Region, it is a homeland that has been inhabited since time immemorial, a place where spiritual relationships with the land and animals are maintained. Knowledge of the land is shared across generations through language, song and stories. Ɂehdzo Got’ı̨nę draw on this knowledge to support wise land stewardship. Ɂehdzo Got’ı̨nę maintain reciprocal relationships with tı̨ch'ádı́ı (wildlife) through harvesting practices that respect Dene ɂeɂah – Dene law. This law ensures that tı̨ch'ádı́ı will be here for future generations. If people take only what they need, share what they harvest, and are careful to prevent wastage, tı̨ch'ádı́ı will continue to give themselves for the survival of Dene and Métis and the continued health of the land. Ɂehdzo Got’ı̨nę have always harvested different tı̨ch'ádı́ı at different times of year, and depending on what is available in their family areas. If there are less caribou and moose, people will harvest more fish, birds, and other species. The elders say that people’s survival and well-being depends on the continued diversity and health of the land and water. Ɂehdzo Got’ı̨nę are identified in the Sahtú Dene and Métis Land Claim Agreement as important community leaders. Different families and communities have always gathered at certain times of year to discuss what they have seen on the land and make plans for the coming harvesting season. Now the discussions might include reviewing development applications or scientific studies. Traditional harvesting is alive and well in the Sahtú Region – but the conditions for harvesting have changed. Ɂehdzo Got’ı̨nę have always been creative in using new tools and technologies for harvesting. Nowadays, travel on the land requires expensive equipment and fuel. This is a mixed economy where people get jobs to obtain the money they need to get out on the land. People have said they want a balance where the money economy and traditional economy are both healthy. The Northwest Territories and Federal Government both have laws for living things experiencing hardship, the Species At Risk Act. In Délı̨nę and Tulı́t’a, the term for this law is Ası̨́į Godı́ Gogha Horı́la Ɂeɂa. K’asho Got’ı̨nę of Fort Good Hope and Colville Lake use the term T’áhsı̨ Gódı Gonezǫ̨́ Begóhdı́le ɁeɁá. Traditional knowledge and science are used to assess how the animals are doing and decide if special measures need to be taken to protect them. We’ve learned a lot about how people understand these things by working on terminology in the different dialects of the Sahtú Region. Everyone wants to find ways to make sure tı̨ch'ádı́ı (wildlife) get the help they need. Ɂehdzo means trap. Got’ı̨nę means people. And Ɂehdzo Got’ı̨nę refers to the Renewable Resources Councils in each community. The trapper is a symbol of the Dene and Métis way of life, the traditional economy of this region. This includes harvesting for food, fuel, medicines, clothing, and tools, creating arts and crafts, or even using traditional skills and knowledge for tourism or research and monitoring. Ɂehdzo Got’ı̨nę have a big responsibility to help maintain the traditional economy during times of change on the land and in the communities. The Sahtú Region is now experiencing a shale oil development exploration boom. The Ɂehdzo Got’ı̨nę Gots’ę́ Nákedı is responsible for providing input on plans for exploration and development toward minimizing impacts on the wildlife, habitat and harvesters. We have learned a lot from Ɂehdzo Got’ı̨nę and scientists. We also work with industry to develop solutions. 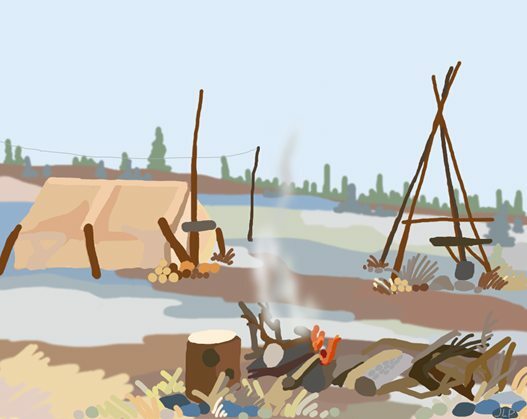 The image is based on a photo of the Begádeé Valley (Keele River Valley) in the Mackenzie Mountains and includes tipi poles to represent the important and lasting presence of Dene people as part of the beautiful Sahtú landscapes. This drawing was done on a digital drawing tablet, a new artistic medium for Jean. The tablet allows her to manipulate the drawing and makes it relatively easy to change colors, lines and shapes. This drawing is based on a photograph of a fish camp on shores of Sahtú - Great Bear Lake. The image includes a fire that is considered sacred by Dene elders and represents a real sign of homeland. Yukon-based artist and facilitator Doug Urquhart gained notoriety for his comic strip Paws, which was the first syndicated cartoon strip ever produced in the north. You can find the well loved characters of Marten Fisher and his dog Skookum in two collections of the strip: Skookum's North and Eyes of the Husky: Skookum's Penetrating Insights Into the Hearts & Minds of Northerners. 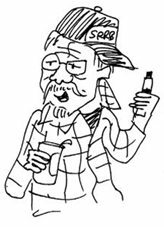 Doug currently resides in Whitehorse, but has lived everywhere from northern Quebec to Fort Smith, Northwest Territories to Atlin, British Columbia and has done nearly every bush job imaginable including: prospector, arctic biologist, conservation officer, weather observer, jail guard, cartoonist, facilitator and environmental consultant. Doug uses his artistic skills and knowledge of the north to help visually represent the array of complex ideas surrounding natural resources management in collaboration with Aboriginal elders and harvesters. His illustrated version of the Renewable Resources Council Training Handbook produced in collaboration with the Dawson District Renewable Resources Council of the Yukon provides detailed, easy to understand direction for the complex roles and responsibilities of the Dawson RRC. Recently, Doug has worked with the Ɂehdzo Got'ı̨nę Got'ı̨nę Gots'ę Nákedı to create icons and pictures to represent some of the important aspects of natural resources management in the Sahtú. You can find Doug's work throughout the site, but especially on the home page map. As the daughter of an artist, Jean has always had an appreciation for visual harmony. She grew up drawing and painting and continues to work to find new ways to include art in her life and work. Jean is currently working on a PhD studying population genetics of woodland caribou in the Sahtú Region in collaboration with the Ɂehdzo Got'ı̨nę Got'ı̨nę Gots'ę Nákedı. The main goal of her research is to develop a comprehensive understanding of the identities and relationships among caribou populations and Dene First Nation people in order to inform and prioritize management efforts. Jean hopes to use art to foster communication and understanding between communities, managers, and scientists. You can find Jean’s drawings as the banner of the home page and the camp drawing corner of the home page.